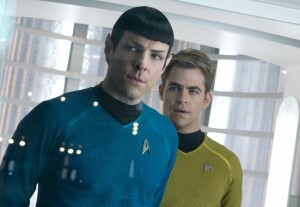 (Left to right) Zachary Quinto is Spock and Chris Pine is Kirk in “STAR TREK INTO DARKNESS.” ©Paramount Pictures. CR: Zade Rosenthal. The entertaining if unsubtle “Star Trek Into Darkness” is an extended “Zero Dark Star Trek” metaphor about terrorism, military madness and the cost of sacrificing ideals for the sake of lawless revenge. That’s because the “Darkness” refers not only to a mass murderer the USS Enterprise must confront, but to an equivalent evil within Starfleet itself. America doesn’t come off very well in this “we have met the enemy and he is us” exercise, which may explain why the film’s end credits include a heavy-handed have-it-both-ways dedication to “post-9/11 veterans.” Right-wingers could have a field day with the implied message that those vets are heroic dupes sent to war for reasons as morally wrong as the ones in this movie. Thinly veiled parables about present-day problems have been a “Star Trek” stock in trade from the start, so the subject of whether things like pre-emptive strikes and executions without trial are justified certainly is fair game for the franchise. If it all seems a bit on the nose in this screenplay by Damon Lindelof and returning 2009 “Star Trek” scribes Roberto Orci and Alex Kurtzman, remember that the original TV series included equally obvious allegories, such as an episode about bigotry among quite literally half-black and half-white aliens. Benedict Cumberbatch plays an icily ruthless villain initially identified as fugitive Starfleet agent John Harrison, who masterminds a London bombing that leads to a deadly skyscraper attack on the organization’s high command. Enterprise Captain James Kirk (Chris Pine) subsequently is dispatched on a kill-not-capture mission so flagrantly at odds with Starfleet’s lofty rule-of-law ideals that engineer Montgomery Scott (Simon Pegg) resigns his post in “I thought we were explorers” disgust. Further complicating matters, Harrison is hiding in off-limits Klingon space, where the Enterprise’s presence could instigate a wide-scale war. When Kirk makes members of the Enterprise’s security detail change out of their uniforms so they can’t be identified as representatives of Starfleet if caught, it’s obvious that a moral line is being crossed. There turns out to be more to Osama bin Laden stand-in Harrison than meets the eye, which lets the plot skate back and forth between whether he actually deserves savagely immediate execution or a civilized trial. Hawkish Starfleet Admiral Marcus (Peter Weller) is so adamant about taking action that he gets to deliver a frothing “you can’t handle the truth”-style justification for shooting first and asking questions never. But can Seal Team Enterprise really kill a man in cold blood? New characters include Barbie-blond and blue-eyed science officer Dr. Carol Marcus (Alice Eve, a little out of her depth even for a popcorn-movie space-opera). Visually, returning 2009 “Star Trek” director J.J. Abrams goes aggravatingly overboard with his inexplicable fondness for blue-line lens flares that mar nearly every scene. That bad habit is so out of control here that one segment includes a virtual criss-cross latticework of those bright blue lines, while another is like watching the action from behind neon-blue venetian blinds. As always, the 3-D presentation is a non-essential gimmick that’s not worth wearing those awful glasses or paying a ticket-price premium. Aside from those annoyances, special effects scenes of volcano-lava peril, interstellar battles and citywide destruction are convincingly impressive. A massive black dreadnaught-class attack ship that is two times the size with three times the speed of the Enterprise is scary cool. Plot-wise, there always will be inherent story problems in a universe where instant site-to-site “beam me up/beam me down” transports (at warp speed between planets, even) are possible. Also, a climactic catastrophe involving Earthward-plummeting starships would be possible only if this planet had no defenses or warning systems whatsoever, which seems unlikely. A more overarching flaw with this rebooted alternate-reality franchise is its habit of recreating moments from previous “Star Trek” movies, a tactic that risks becoming more in-joke insular than endearing. (Small spoiler alert ahead.) New Spock ringing up old Spock (Leonard Nimoy) to ask for guidance about a similar threat faced by the classic version of the Enterprise crew feels like a cheat, and one that’s not even (ahem) logical. 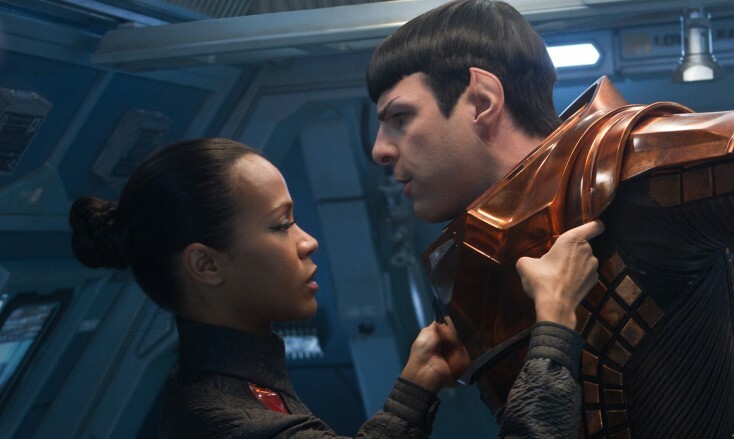 Because many things in this new “Star Trek” reality differ wildly from events in the classic series timeline—such as new Spock’s love affair with Lt. Uhura—there’s no reason to believe that any character necessarily would behave the same way in both universes. One of the things that made 2009’s “Star Trek” intriguing and fresh was its use of new characters who looked and sounded like yesteryear’s Enterprise crew but were unbound by that series’ chronology and preconceptions. The studio was able to have its cake and eat it too by retaining all of the series’ beloved archetypes without technically recasting those roles. In future installments, it would be nice if the new characters were allowed to boldly go where no one has gone before, instead of being saddled with so many winking references to the past.